The convertible car seat you buy will be a part of your family through multiple stages of your child’s life, and maybe even through multiple children. To find the seats worthy of such an investment, we dug through research and talked to experts to find out what makes car seats safe, then surveyed over 100 parents about seat features that simplify daily use. Our mission: Find a convertible car seat you can learn to use correctly every time. Every car seat on the market has been rigorously tested and certified by its manufacturer to ensure that it meets federal safety standards. So you can expect any of the car seats out there (provided they’re installed and adjusted correctly) to start on an even playing field in terms of safety. Dr. Benjamin Hoffman, Chairperson for the American Academy of Pediatrics’ Council on Injury, Violence, and Poison Prevention told us that any extra features offering “added protection” aren’t federally regulated — though regulations for side-impact protection are in the works. While we applaud those manufacturers for trying to advance safety technology, we just can’t consider their features a bonus when comparing seats until there’s a standard. Luckily, the Department of Transportation has an agency that evaluates car seats, looking for the qualities that make them easy to install and use safely: the National Highway Traffic and Safety Administration (NHTSA). The NHTSA reviews as many popular and new car seats as possible by keeping an eye on the market and revisiting car seats when the manufacturers revamp their models; with that system, it ends up testing the most popular and trusted brands of seats out there. After sifting through NHTSA’s list of 34 tested convertible seats and eliminating any discontinued models, we started narrowing down the field based on its findings. Each seat may be safe in testing, but after a car seat leaves the manufacturer, its ability to protect a child in a crash is in the hands of parents and caretakers. And it turns out many well-meaning people aren’t using their car seats in ways that actually keep kids safe. A 2016 study published in the Journal of Pediatrics found that 95% of families used their car seat incorrectly when taking their newborn home from the hospital. An earlier paper from 2002 concluded that 73% of parents using car seats were “critically misusing” them. That means most parents are doing something wrong with their car seats, the most common mistakes in both studies being installation issues and harness straps/chest clips that weren’t properly adjusted. NHTSA assigns “overall ease-of-use” ratings of one to five stars based on four categories: labeling, instructions, securing the child, and vehicle installation features. Within each of those categories, it compares them according to a five-star rating system. The best car seat should function at least above average for overall ease-of-use to give parents the best chance of keeping their child safe. 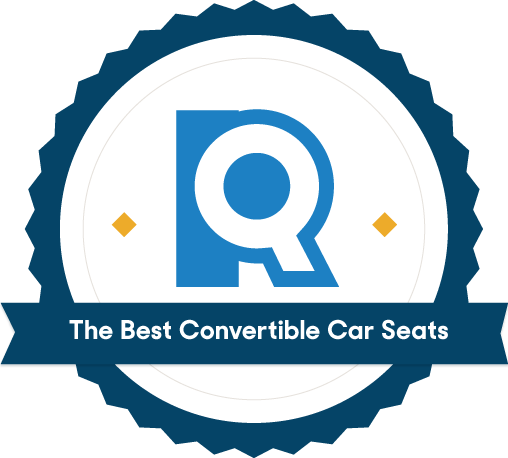 By requiring that all convertible seats get at least a four-star rating overall, we narrowed the list down to seven seats that are government-vetted as the easiest to use safely. We also wanted to specifically make sure that parents could easily install and adjust the seat correctly, since that’s where parents are most likely to make mistakes. So, we made sure that none of the seats with overall high scores lack features in those crucial areas. That eliminated one of the most expensive remaining seats: the Clek Fllo. Although the Fllo has gotten some acclaim as an easy seat to fit into narrow areas, it earned just one star for installation features in rear-facing and three for forward-facing. According to research from NHTSA and Consumer Reports, the Fllo’s big flaw lies in its seat belt installation features. 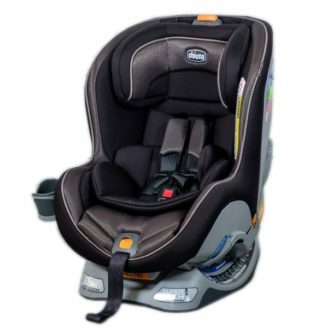 NHTSA references a difficult belt-positioning feature when rear-facing and a lack of clear labeling to help parents install the seat correctly. Similarly, Consumer Reports said that its built-in seat belt lock-offs are hard to work with and break easily. Moms and dads are experts at driving while parenting — but every parent’s experience is a little bit different. We wanted to recommend a car seat that everyone could love, so we surveyed over 100 parents about what they value and what they find confusing about their car seat. The 116 parents we surveyed told us they valued ease of adjustment the most in a convertible car seat. Almost 50% of parents we surveyed included ease of adjustment in their top-three criteria when buying a convertible seat and 48% included ease of loading/unloading their child, followed closely by how long they’ll be able to use the seat and how comfortable the padding and material of the seat are. With this data in hand, we ordered our six contenders for in-person evaluation, focusing on the qualities that scored highest in our parent survey. 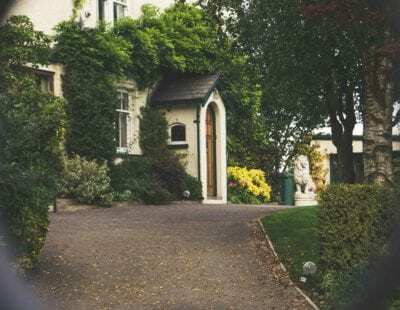 To get a feel for any potential issues that might arise with loading or unloading children and the comfort of the seat, we needed help from the pros. So, we invited four parents of infants and toddlers to evaluate the seats, listening to feedback on each seat's buckles, straps, and padding. And while “ease of cleaning” wasn’t a top priority among survey respondents, testers noted a big difference in the washability and number of crumb-collecting crannies between seats. Parents agreed: All convertible car seats will be somewhat annoying to install, and it’ll be a pain to take your kid in and out of any car seat — but some make it easier. All of the features that make daily use simpler in the most streamlined, attractive package possible. Parents were immediately drawn to the NextFit’s pod-like, contained design in comparison to other, more boxy seats. But the NextFit is hands-down the most practical, too. Its nine recline positions mean that it’s most likely to help you achieve a safe angle of recline for your child, regardless of the size and shape of your car's back seat. Our parent testers latched onto one particular usability feature on every seat: the leveling system that confirms whether or not your seat is at a safe angle for your child. The NextFit was the only seat we tested with its bubble level indicator at eye-level and on both sides of the seat. Most other car seats’ levels are near the bottom — which means you’d have to bend over to check if the seat is level every time you adjust it. The NextFit (left) places its level indicator at eye-level instead of at the bottom like the Britax Marathon (right). 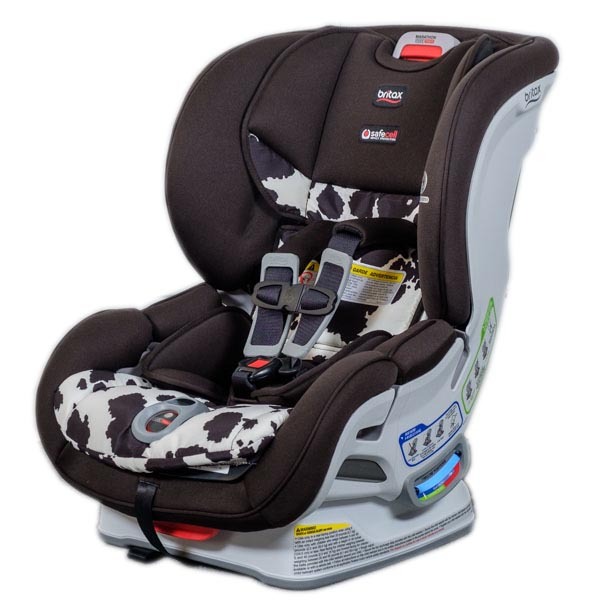 That might’ve been enough to give the NextFit an edge over the other seats already, but child comfort was the priority with parents that solidified Chicco’s winning status. 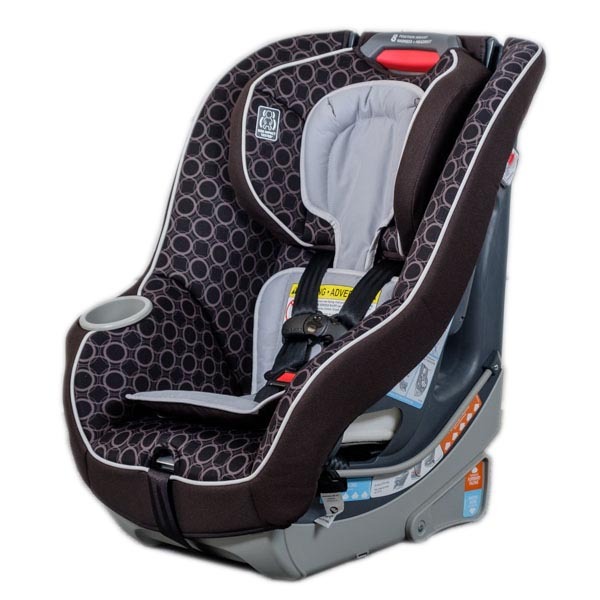 Parents loved the airplane-pillow-shaped headrest and memory-foam-like texture of the seat cushion, especially when compared to the other, less luxe-feeling materials on the Graco and Britax seats. Combined with the seat’s superior (machine-washable) cushioning and removable cupholder, parents walked away convinced that this seat would make their kid happiest. The Chicco is much heavier than the Graco (though not quite as heavy as the Britax); lifting it feels similar to carrying a very full bag of groceries. That’s fine if you plan to leave it in one car — nearly half of the parents we surveyed do — but if you want a seat you could bring to the airport when traveling or move between cars in the driveway regularly, you may be better off with a lighter seat. The only reservation we had about the Chicco was a lower-than-average score in NHTSA’s ease-of-installation for rear-facing, saying that the person installing the seat “must move padding to route the vehicle belt,” and that some “interference” is possible between the seat and the belt routing system. Despite those issues, it did earn a “very good” rating for rear-facing belt installation from Consumer Reports. And since the everyday usability features of the NextFit surpassed all others, we were willing to forgive the potential extra difficulty. It’s heavier and harder to clean than our top pick. Still, it’s a practical option with superb features and a notably long lifespan. The Britax came in with the highest NHTSA ease-of-use ratings of any of our picks, meaning this seat can be installed as easily as is possible, facing either direction using both LATCH and seat belt methods. And with seven recline positions, this one is almost as likely as the NextFit to help you achieve the perfect recline angle in your car. Parents who want to use one seat for multiple kids should take note that the Marathon’s time-to-expiration is two years longer than either of our other picks at 10 years (Graco’s is seven years from when it was manufactured, Chicco’s is eight). The seat's drawbacks emerged only when our parent testers picked it up. The seat itself is the bulkiest we tested, and testers noted that its slick, sporty seat fabric felt much less comfortable than the plush texture of the NextFit. Additionally, the seat doesn’t come with a cup holder or any extra child-focused accessories. In addition to being less comfortable, the Marathon’s fabric isn’t machine-washable or tumble-dry safe, making it more difficult to clean. Far and away the lightest seat we tested. This one has a few quirks that make it trickier to install, but it's half the price of our other picks. We liked that the Contender has the easy-to-adjust no-rethread harness and comfortable padding to compete with our top picks — for $160 less than the Chicco. The padding is also machine-washable, unlike the Britax, which our parent testers thought was a huge plus. The Contender was also the lightest car seat we tested, coming in at 10 lbs lighter than our other two top picks. This makes it a great fit for parents who might be moving the seat among cars often or plan to travel regularly by plane with their child. 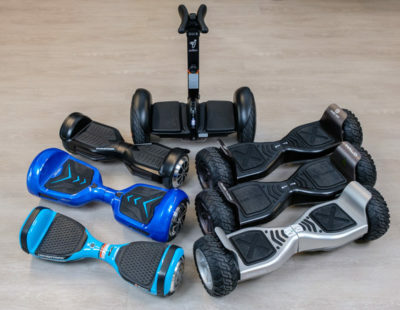 In a few areas, the Contender received average or below average ease-of-use ratings from NHTSA. Most notably, its manual excludes instructions for using LATCH — both rear and forward facing installation requires you to twist its LATCH attachments to remove it from the vehicle anchors, which might be harder if you have large hands. The one drawback to the Graco in terms of cleanliness is its cup holder. Since it’s built into the structure of the seat and can’t be removed for cleaning, it’s essentially asking for the accumulation of crumbs. We imagine occasional vacuuming is a commitment when buying this one, and parents generally preferred the Chicco NextFit’s more convenient, removable cup holder. The American Academy of Pediatrics recommends driving with your child in a rear-facing car seat until they’re at least two years old. That means every parent needs to purchase a car seat that has a rear-facing option before bringing their baby home from the hospital; but deciding which one to buy means making a series of choices. The first decision is whether your child’s first car seat will be an infant seat (rear-facing only, with a carrier that’s detachable) or convertible seat (can be installed rear-facing at first, then reinstalled forward-facing when the child is ready). In terms of your infant’s safety, Dr. Hoffman said that there’s no difference in putting your baby in an infant seat versus a rear-facing convertible seat. But there are pros and cons that amount to parents choosing one over the other. Of the parents we surveyed, 56% said they would purchase an infant seat first if they could do it all over again. But most parents will need a convertible seat sooner or later; Dr. Hoffman said that babies hit the height limits by nine to 12 months. And if a parent wants to comply with the AAP’s recommendation of keeping their baby rear-facing for the first two years, they’ll need to buy and install a rear-facing convertible car seat as soon as they hit that limit. Keep in mind that even the best car seat may not fit in your specific car or with your child. The car seats we recommend — especially the Britax and Chicco — are versatile, but you’ll need to check your specific vehicle’s owner’s manual to know if the one you want is a fit. For instance, the way your seat belts are attached to your car and the size of your vehicle seat from front to back can sometimes determine which car seats can be safely installed. You’ll also need to take into account your child’s height, weight, and developmental abilities before you shop to know if our picks will keep your child safe. All car seats on the market have been tested and certified by manufacturers to meet federal safety standards — but they’re only safe when used correctly. To make sure that your car seat is correctly installed, bring your car seat to a licensed Child Passenger Safety Technician for a free inspection. It may not seem like a big deal, but registering your car seat is how you’ll be alerted if there’s a recall on the seat or its parts — sometimes companies even auto-send you replacement parts, making it easier for you to keep your child safe. Already toss the postage-paid registration card that came with your car seat? 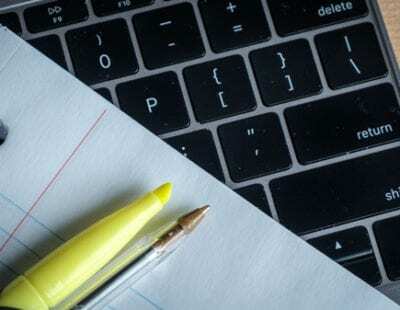 You can register online with your manufacturer using its model number, serial number, and manufactured date. What's a built-in seat belt lock-off? When a car seat’s correctly installed with a seat belt, you shouldn’t be able to move it more than 1 inch in any direction. To get the most secure installation possible, look for built-in seat belt lock-offs. Many top-rated seats have the feature, though every brand does it a little differently. The basic concept stays the same: You feed the belt through the seat and clamp it tightly to the seat itself with a vice-like grip, so your child is securely strapped in. The more old-school device for cars without automatically locking seat belts is the locking clip: an H-shaped piece of metal used to keep the lap and shoulder belts clamped together after they’re pulled through the seat. Both are safe, but built-in lock-offs are more straightforward. Why does developmental ability matter with car seats? Dr. Hoffman told us that if your child is developing typically, “manufacturers’ guidelines are fine.” But if you have a child with a neuromuscular issue, a crash might affect them differently, making rear-facing the best option for them for a longer period of time than a typically developing child. If your child has any neuromuscular challenges, Dr. Hoffman suggests asking your pediatrician to refer you to the right sources for car seat advice. What's the difference between a rethread and no-rethread harness? As a child grows, parents should adjust their car seat’s harness to maintain a safe fit; a rethread harness requires parents to take off a seat cover, pull the harness straps through the slots in the back of the seat, and then rethread the harness back through at the correct setting for their growing child. A no-rethread harness cuts out hassle by making the adjustments all external, with no clumsy threading process required. Why do car seats have an expiration date? The metal and plastic in seats expand and contract due to temperature changes and can crack or break down over time, and safety standards change every so often. To ensure that your car seat is current in terms of safety and material integrity, keep an eye on that date — you should be able to find it on one of your seat’s labels.